With this issue, the Blake Newsletter concludes its first year of publication. The response from Blake scholars has been generous and enthusiastic, and we thank our many contributors and correspondents for their support, something it has been impossible to do adequately in individual correspondence. Our only serious problem at the moment is, paradoxically, the success of the Newsletter. We produced 120 copies of #3 and found that this was about the limit that our resources of time, energy and assistance will allow. If most of our original subscribers re-subscribe, and if new subscriptions continue to come in at the present rate, we will soon reach a point where we can no longer fill new orders. The alternative to this would be to find some institutional support which would allow us to have the physical production of the Newsletter done professionally, along with perhaps the mailing and addressing of copies. The point to be emphasized is that we can continue as at present for an indefinite time, but we cannot continue to grow without changing our present arrangements for publication and distribution. We do not in any event plan to alter the informal nature of the Newsletter. Most subscriptions to the Newsletter expire with this issue. If you have received Numbers 1-4 and wish to receive Numbers 5-8, please remember to resubscribe. Extensive tally-keeping and reminder-sending would seriously interfere with work on our June issue, which is scheduled for June 15. We once more welcome contributions of news, notes, queries, and discussion items. The deadline for submissions is June 1. The June issue will include a checklist of recent articles on Blake, including reviews. If you know of any that are likely to escape us, please let us know. 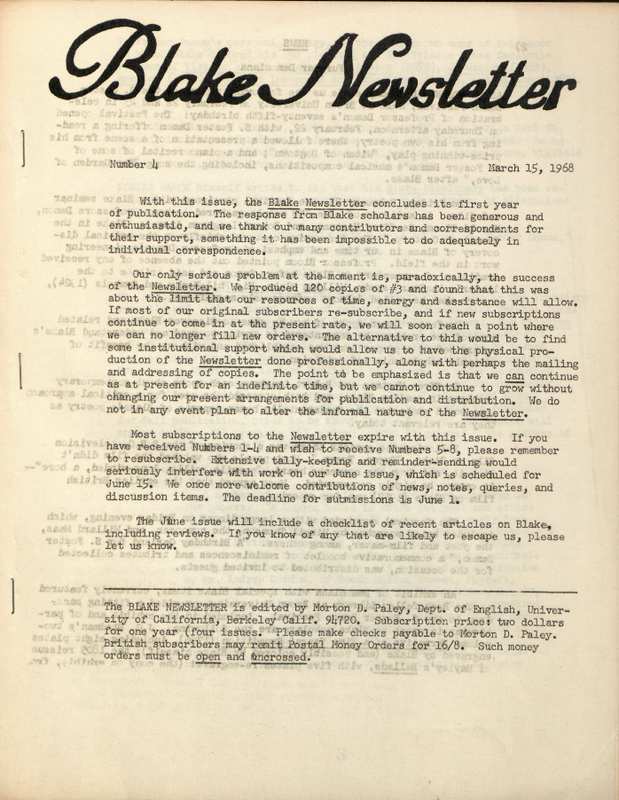 The BLAKE NEWSLETTER is edited by Morton D. Paley, Dept. of English, University of California, Berkeley Calif. 94720. Subscription price: two dollars for one year (four issues. Please make checks payable to Morton D. Paley. British subscribers may remit Postal Money Orders for 16/8. Such money orders must be open and uncrossed. The BLAKE NEWSLETTER is copyright 1968 by Morton D. Paley and its contents may not be reproduced without written permission. This is in order to protect our contributors, who are of course welcome to reprint their own material.